Plano TX Townhome For Sale – Contract NOW for July move-in! Master suite is down on this gorgeous end-unit townhome. Beautiful brick-stone exterior with hand-laid brick porch, and 8ft Knotty Alder front door with speakeasy welcomes you. Storage galore in gourmet island kitchen with butlers pantry, SS appliances, gas cooktop, Granite, Maple cabs. Bronze fixtures Pkg. Gas on private patio. 16 SEER HVAC, Radiant Barrier, cocoon insulation, dual-pane, low-E windows. 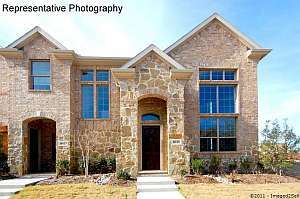 Plano Texas Townhome For Sale for Current Pricing, Details, Photos, and Virtual Tour. Visit the builder’s blog for more information on The Enclaves at Willow Crest.